So you want to ride the Bernina Express. Here are some of the most Frequently Asked Questions that we receive on the topic, so you have everything you need to know before you go. You may even like to Bookmark This Page so you can refer to it again. What is the Bernina Express?? It is a train that crosses the Swiss Engadin Alps that stretches from Chur in Switzerland to Tirano in Italy, via St. Moritz. There are two lines; The Albula line runs between Chur and St. Moritz, and the Bernina line between St. Moritz and Tirano. What makes it so special anyway? It is the highest railway crossing in Europe, reaching a height of 2,253m above sea level. It begins its journey winding through the streets of Tirano like a tram! It became a UNESCO world heritage site in 2008, one hundred years after it first opened to the public. Any time of year is a good time to ride the Bernina Express. The winter offers beautiful snowy landscapes, the late spring and summer verdant hillside (if the weather is sunny in July and August there is even an open top carriage! ), and the autumn colours in October and November are simply spectacular. Between 2 and 2 and a half hours each way, so make sure that you leave enough time to enjoy St. Moritz between journeys. What can we do in St. Moritz? Stretch your legs and go for a wander around the town with its exclusive shops, or around the large lake where you can watch people sailing during the summer months. If you have time you could even take a cable car up the mountain – though check to make sure you won’t be rushing to get your return train. There are two train stations in Tirano, one is the mainline station with trains to Milan, the other is the Rhaetian railway (‘Ferrovia Retica’ in Italian or ‘Rhätische Bahn’ in German) for the Bernina Express. They are located next to each other but the latter is well signposted so you will find it without any trouble. 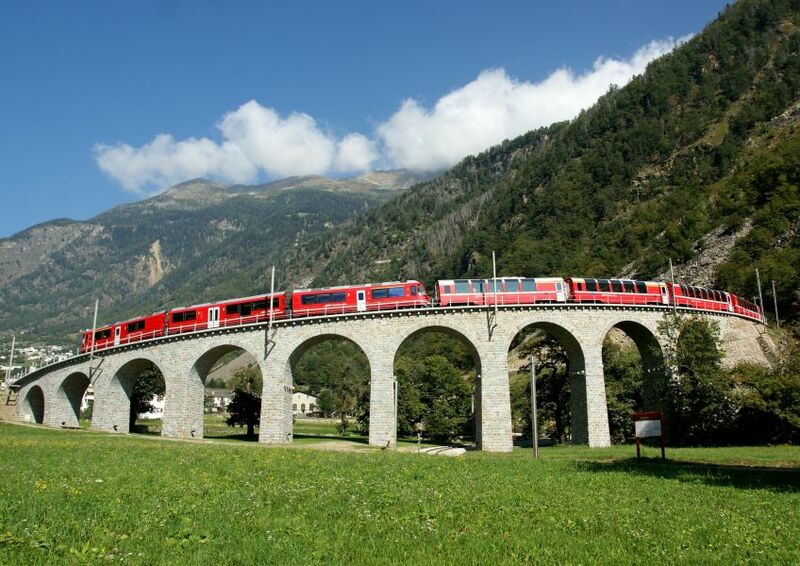 The distinctive looking red train travels from Tirano in Northern Italy to St. Moritz in Switzerland, so as you are crossing international borders DON’T FORGET YOUR PASSPORT! Normal 1st and 2nd class tickets do not have numbered seating, only the panoramic carriages do. These have higher windows so you can enjoy even more of the landscape. Not all the trains on the route have panoramic carriages so check and make sure the one you want to get does. Panoramic tickets must be booked in advance, there is a small supplement of around € 14 each way. You can always take the panoramic carriage on the way to St. Moritz and the normal carriage on the way back. Not found what you were looking for? Still have questions? Then drop us a line and we can help! Our Bernina Express packages take the Bernina line from Tirano to St. Moritz and back again. Ideal for a quick getaway they are available all year round.